Together Speech and Language Services provides a variety of services to meet your speech therapy needs. We are able to offer assessment, therapy, coaching and training, as well as consultation services to families and teams. SLP interventions provided include articulation therapy, language therapy, stuttering and voice therapy, aphasia therapy, social skills therapy, AAC therapy (Augmentative and Alternative Communication therapy) and more. family-centered assessment and intervention services to children and adults in Vancouver, Burnaby, New Westminster, Richmond, and the Lower Mainland. We are a passionate team of SLPs that strives to provide therapy that is individualized, functional, and evidence-based. We offer home and community-based services and are enthusiastic, experienced Speech-Language Pathologists who love to work together with our clients to achieve their communication goals. We are dedicated to helping clients reach their full potential by taking a strengths-based perspective. We see individuals with Autism Spectrum Disorder, Down Syndrome, Cerebral Palsy and other developmental and neurological delays as well as individuals who have had a stroke or traumatic brain injury. We provide therapy for speech sound delays, language delays, stuttering, apraxia, dysarthria, voice, aphasia and cognitive communication impairments. We are currently serving clients in Vancouver, Burnaby, New Westminster and Richmond. Lizette has extensive experience working with preschool children and school-aged students with a variety of speech and language needs, developmental disabilities and syndromes. Lizette’s main areas of clinical interest include early language delay, articulation, working on social communication with children with autism spectrum disorder as well as working with clients who use Augmentative and Alternative Communication (AAC). She also enjoys working with adults with aphasia and has previously been involved with aphasia groups. Lizette strongly values working together with families, clients and other professionals throughout the assessment and therapy process in order to ensure goals and activities are functional and meaningful. Lizette brings additional skills and insights from her previous experiences as a student support worker/educational assistant in the schools and as a behaviour interventionist to provide a well-rounded approach to speech therapy. Lizette is certified in the Hanen “More Than Words” program for parents of children with autism or social pragmatic disorders and the Hanen “It Takes Two to Talk” program for parents of children with language delays. She has received training in the Picture Exchange Communication System (PECS) as well as training around a variety of AAC topics, approaches, apps and Social Thinking concepts. 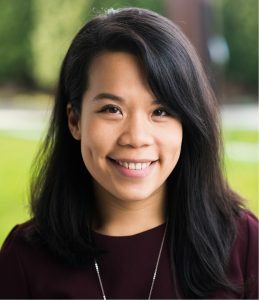 Lizette is a Registered Speech-Language Pathologist through the College of Speech and Hearing Health Professionals of British Columbia (CSHHPBC). She is certified by Speech-Language and Audiology Canada (SAC) and is a member of Speech and Hearing BC. Lizette is also on the Registry of Autism Service Providers (RASP). Colleen received her Master of Science degree in Speech-Language Pathology from the University of British Columbia. Colleen is dedicated to collaborating with clients, their families, and interdisciplinary team members in creating functional and personal goals to support clients in strengthening their communication skills. Colleen enjoys working with school age children on articulation, fluency, social communication, and a variety of language goals, from grammar to narratives. Colleen also has extensive experience providing therapy to individuals rehabilitating from brain injury. In particular, she has worked with individuals with a range of acquired speech and language impairments, such as aphasia, dysarthria, apraxia of speech, and cognitive-communication disorders. Colleen is certified in Lee Silverman Voice Therapy (LSVT). Colleen is a Registered Speech-Language Pathologist by the College of Speech and Hearing Health Professionals of British Columbia (CSHHPBC). She is also certified by Speech-Language and Audiology Canada (SAC) and is a member of Speech and Hearing BC. Nicole received her Master of Science Degree in Speech and Language Sciences from University College London. She then worked for the National Health Service in London, England, working with preschool children, prior to returning to Vancouver in 2018. Nicole has experience working with preschool and young school-aged children with a range of speech and language needs. Her main areas of clinical interest include articulation and phonology, receptive and expressive language disorders, autism spectrum disorder, and AAC. She strives to ensure an approach that is both individualized and functional. Nicole has completed training on the Curiosity Programme (by Gina Davies) for supporting young children who present with early difficulties in social interaction and communication. She is also trained in Makaton, a language program using signs and symbols. She is fluent in English and Tagalog. Nicole is a Registered Speech-Language Pathologist with the College of Speech and Hearing Health Professionals of British Columbia (CSHHPBC). She is certified by Speech-Language and Audiology Canada (SAC) and is a member of Speech and Hearing BC. Nicole is also listed on the Registry of Autism Service Providers (RASP). Stephanie received her Master of Science from the University of British Columbia in 2015. Since then, she has worked with adults across the continuum of care – in the acute setting as well as inpatient, outpatient and community rehabilitation. She enjoys working with individuals, their support network and groups. Stephanie provides intervention to adults with motor speech, language, voice, cognitive-communication and swallowing disorders. She partners with her clients in order to support and enhance their current abilities, and help them achieve their goals of better health, communication and quality of life. Stephanie has advanced training in Videofluoroscopic Assessment of Adult Swallowing Disorders, Fiberoptic Endoscopic Evaluation and Management of Swallowing Disorders and Swallowing Assessment and Management for Tracheostomy. She is registered with the College of Speech and Hearing Health Professionals of British Columbia and certified by Speech-Language and Audiology Canada. She is a member of Speech and Hearing BC and a clinical faculty member at the University of British Columbia. She is fluent in English and German. © 2019 Together Speech and Language Services Inc.